Colin Lin used recycled newspaper to create environmentally friendly ballet flats that are crafted from recycled Chinese language newspapers that are woven into a lattice pattern, then dipped in plastic for weather protection and durability. This is good to know that wast create the best. 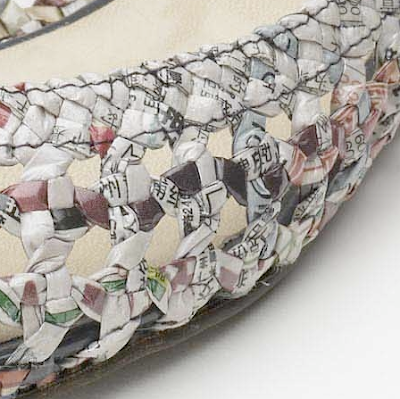 in this picture showing that by using the news paper how creatively made the shoes. 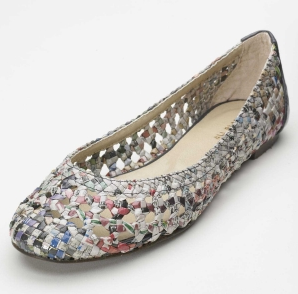 OK good idea to save some material and at the same time reuse this material, the design is cool but we have a serious problem if we are wearing this type of ballet flats and start to rain. Actually have a very nice blog, I wish I could see everything you have all the time, I'm really entertained by your comments, and best wishes for your blog.